SKU: GB01. Category: Arcade Game Boards. These gameboards feature 60 of the most popular classic arcade games of all time. Each of the games are precise in look, feel and gameplay to the originals of over 20 years ago. 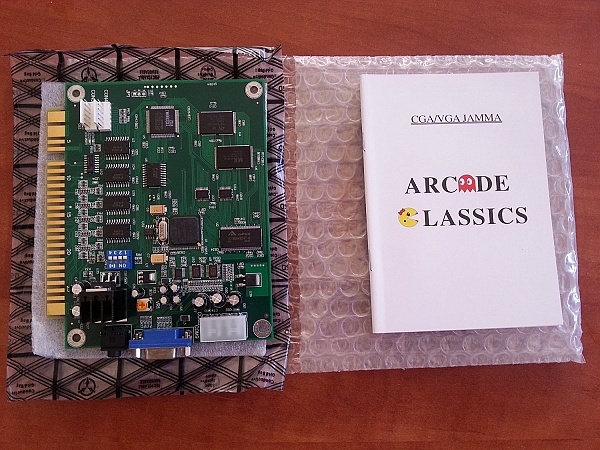 The boards are compact in size (20cm X 16cm) and accept a JAMMA harness so they can be fitted directly to a JAMMA cabinet for immediate gameplay. Note that your monitor needs to be in the VERTICAL orientation to correctly display the output from this gameboard. Games are user selectable from a simple menu and an on-screen config menu allows alterations to elements of each game, such as number of lives, difficulty settings and bonuses. Video signal output can be changed from 15kHz (arcade monitor) to 31kHz (PC monitor) literally with the flick of a switch, for easy connection to either type of monitor. There is a standard VGA socket on-board for direct connection to a PC monitor – no PC or video card required! Next to the VGA socket is a standard PC type “Molex” power socket which allows very easy connection of our Compact Power Supply. 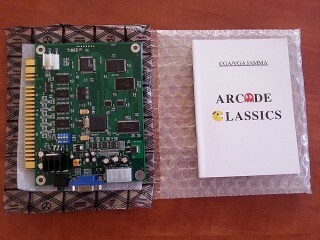 In addition to this they also have a 3.5mm RCA socket for connection of speakers and it is quite common for these boards to be used with a pair of amplified PC speakers which tends to provide ample sound. All of that makes these boards extremely versatile and they offer a painless alternative to setting up MAME or another emulator in your home arcade machine – especially if you are not great with PCs. You may need to watch it a couple of times to be clear on what is required!